– Lecturer, one position in Vision and Signal Processing. 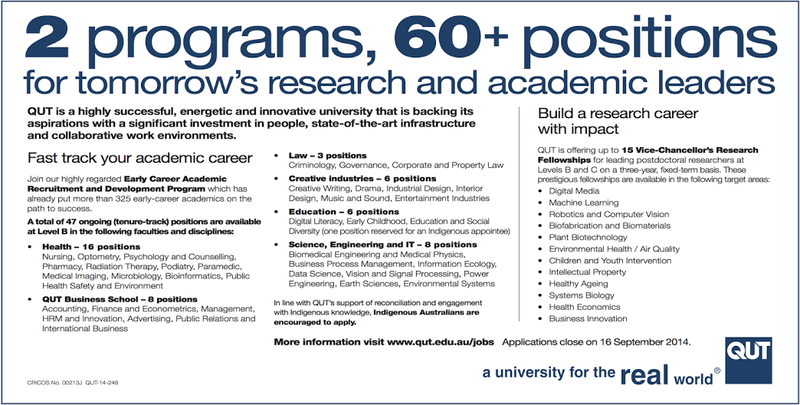 Tenure track in QUT’s Early Career Academic Recruitment and Development (ECARD) program, salary range AUD84-100k. – Vice Chancellor’s Research Fellow (VCRF), multiple positions in Machine Learning and Robotics & Computer Vision, 3 year research only position, salary range AUD84-119k. Successful applicants would work within the Robotics and Autonomous Systems group (http://tiny.cc/cyphy), and with researchers from the new Centre of Excellence for Robotic Vision (http://roboticvision.org). This is an academic concentration of 12 faculty, 10+ postdocs and 20+ PhD students with strong links to other Australian and international universities.